Home / SkinCare / JOIK Natural Luxury Skincare. JOIK presents natural luxury skincare products with a high luxurious appeal. Using nature to their best advantage, but also caring for nature, JOIK presents the goodness from nature combined with luxurious emotions of scent and colour to offer a range of products that include the finest ingredients to ensure high quality results with high quality pampering. All products are formulated to be skin friendly, free of parabens, petrochemicals, sulphates and other harmful ingredients. JOIK products are not tested on animals. 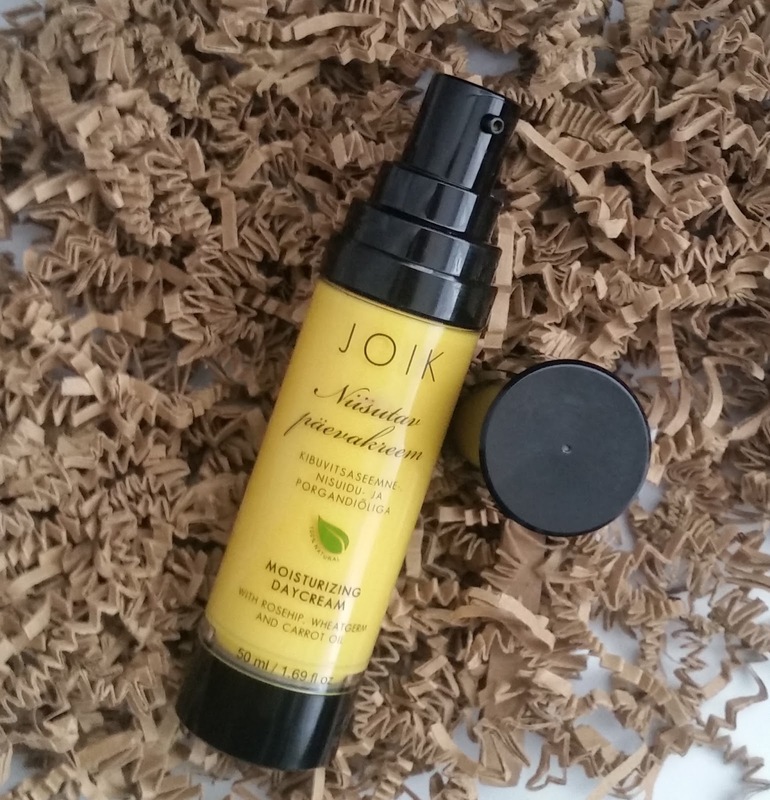 JOIK Moisturising Day Cream With Rose Hip, Wheat Germ, Carrot Oils, 50ml. The JOIK light formulated day cream absorbs quickly into skin, leaving it silky and smooth. * Rose hip seed oil is rich in vitamins A and E, which help to boost skin cell regeneration, restore the collagen levels in the skin and keep the skin younger looking for longer; * E vitamin-rich wheat germ oil nurtures the skin and protects it from environmental damages; * Jojoba oil and Shea butter moisturise efficiently; * Hibiscus tea and carrot seed oil give the cream a nice yellow colour and a good dose of vitamins C and A, carrot seed oil helps to improve skin tone; JOIK day cream does not contain any synthetic colourants or fragrances. JOIK Moisturising Day Cream Ingredients. How To Use JOIK Moisturising Day Cream. Using the pump on the bottle to dispense the product on your finger tips, apply gently on your skin whilst using circular motions. The day cream glides over skin with ease and absorbs really quickly to allow you to complete your skincare regime. Skin is left moisturised without feeling sticky and a perfect base is presented for you to apply your sunscreen whilst being ideal to use under make-up. 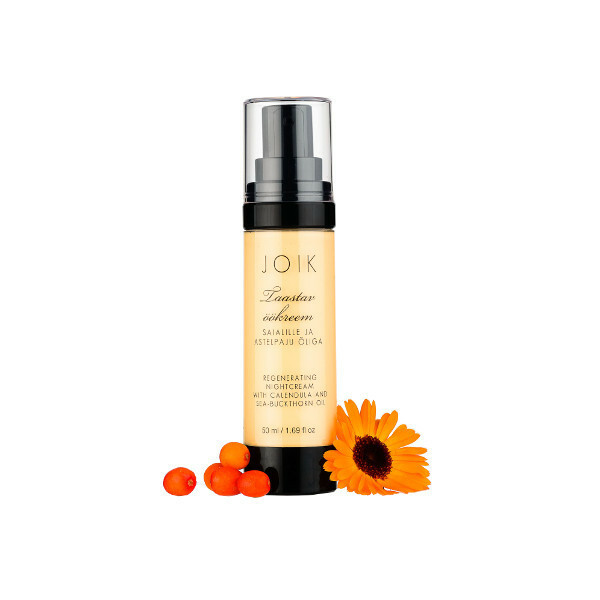 JOIK Regenerating Night Cream With Calendula Extract, Sea Buckthorn & Jojoba Oil. The JOIK night cream nurtures and stimulates the skin helping it to regenerate and restore from daily stress. During colder seasons it is also perfect as a protective day cream for dry skin. * A, E, C vitamin rich sea-buckthorn oil stimulates the skin’s natural cell renewal, helps to restore its collagen level and to prevent premature ageing; * Gentle calendula oil soothes the skin and promotes its natural healing; * Shea butter and olive oil nourish and moisturise; * with a pleasant aroma of orange essential oil. JOIK night cream does not contain any synthetic colourants or fragrances. JOIK Regenerating Night Cream Ingredients. 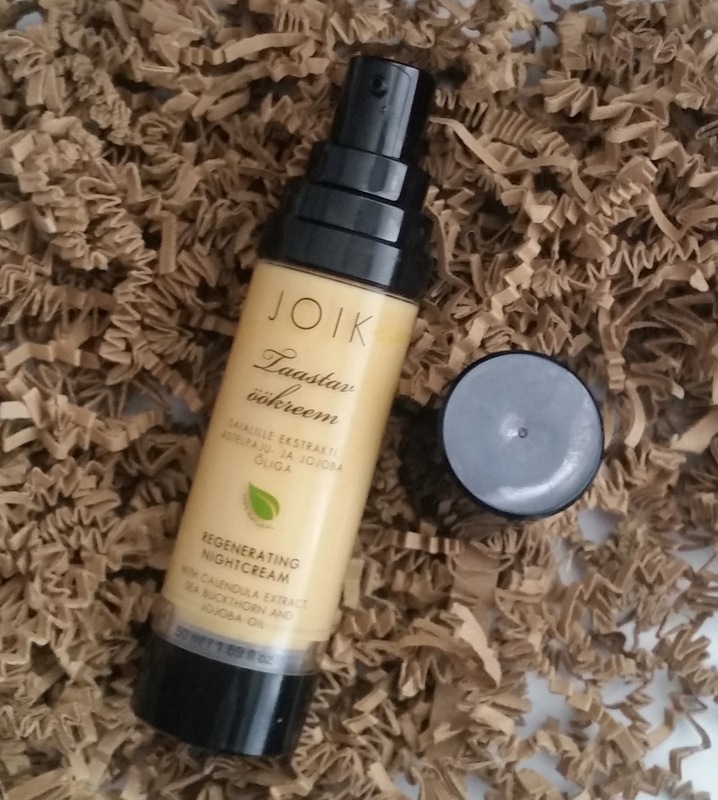 How To Use JOIK Regenerating Night Cream 50ml. Using the pump applicator, dispense onto finger tips and apply on your face before going to bed. The night cream is a creamy light texture that glides over skin with ease, easing your days stresses away. Skin is left perfectly moisturised and cared for to regenerate over night. Using the cream on its own or applying an oil over it, either way u will awake to a restored complexion. The night cream can be used for the extra dry skin types during colder seasons throughout the day. 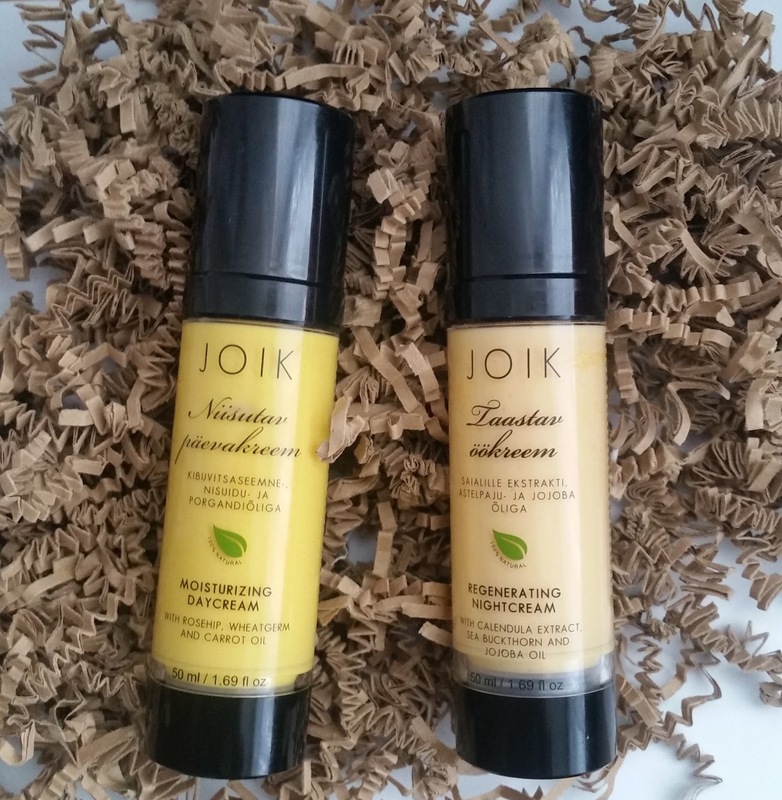 The JOIK day and night cream set themselves apart from each other thanks to their colour, as well as their ingredients.Yellow belonging to the day cream, which is a perfect moisturising day cream that transforms your skin to a soft and silky texture ending all those bad skin days! Pink omitting from the night cream, wipes away the days stresses whilst regenerating skin back to its former glory, helping your skin look refreshed the next morning hiding those late nights! 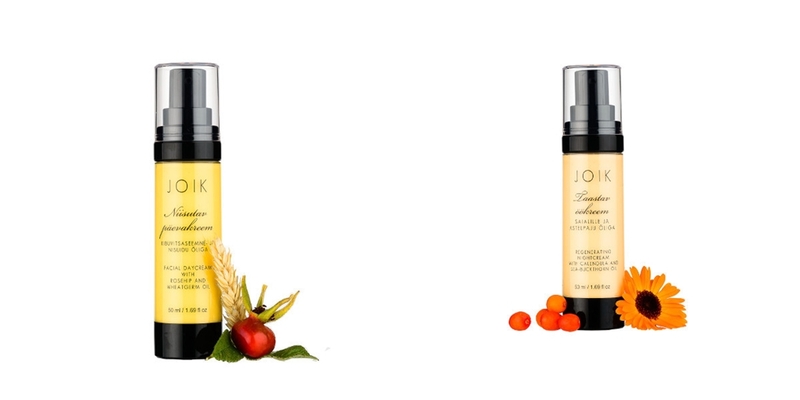 The JOIK skincare range is 100% natural, providing a skincare range for beginners or products to be used in an existing layering skincare regime. Find out more by visiting the natural luxury skincare range at ManOrganic. X Neil.